I bought a used copy of Bushido Blade for the PSX and began replaying it tonight. It's still a fun and very interesting game from a mechanical standpoint, but what I hadn't remembered was its broad set of subfeatures and its unapologetic localization style. There are a number of "flourish" features in the game that are just sort of strange, left-field ideas that could nevertheless make it to retail in the age when Bushido Blade was first released. 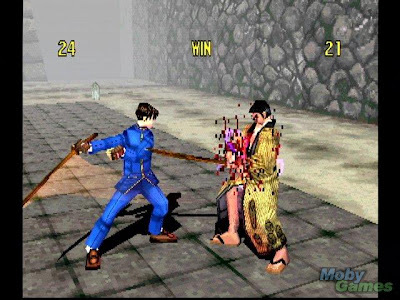 For instance, while Bushido Blade is first and foremost a third-person swordfighting game, the developers also included a "POV Mode," which allows the player to control his avatar in a (near-useless) first-person perspective. It's novel-- hell, semi-experimental-- but in 1997 warranted its own main menu entry. Smaller touches include a black & white mode, which desaturates the screen entirely, much like the same feature found in Sam & Max Hit the Road. Presumably in Bushido Blade this is to emulate the feel of an old samurai movie-- a worthy aesthetic goal, and nice to see as a supported menu option as opposed to a hidden cheat code. The localization of the game is striking for how little it tries to hide its Japanese origins on any level. Except for one opening narration, there is no English language track: Bushido Blade is a subtitled game, period. Unlike newer games with an equally Japanese premise, such as Sega's Yakuza, when you pick up Bushido Blade you're signed on for Japanese vocals with subtitles. Kanji also appears prominently throughout, on the character selection screen and elsewhere. Where many publishers attempt to Westernize Japanese games as heavily as possible to draw a mass market audience, Bushido Blade stands by its identity unabashedly. Other great touches in the core game include the player character getting bandaged up in places they're struck non-fatally by a sword swing, resulting in most of my playthroughs ending with my character sporting a cool-looking bandage eyepatch. The game also offers the ability for the player to mix-and-match any character with any weapon. While many games would automatically pair the quick, weak character with the small, nimble weapon and so forth, Bushido Blade allows you to equip a rapier to the hulking brawler or a battle hammer to the waifish female fighter, to your own handicap (and amusement.) The internal matrix resulting from all those combinations of characters and weapons must have been incredibly complex from a production standpoint, but pays off in the player's feeling of agency and the inherent replayability of the game. These are all risky decisions that I feel may only be possible with a game of Bushido Blade's limited scope. 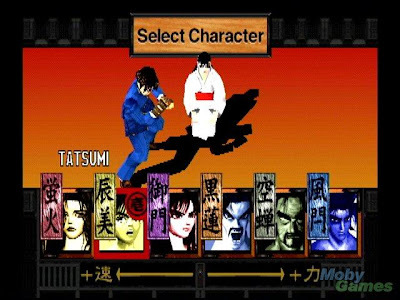 If the production costs had been in line with a modern-day AAA title, and the target audience broad enough to support such an investment, could the game have gone out on a limb for oddball features like black & white or POV mode, committed to a huge mix-and-match matrix of fighting styles and animations, or stuck to its baldly Japanese presentation? I'd wager not. 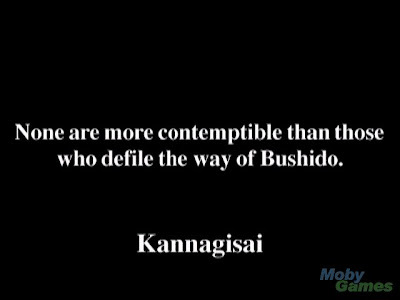 Looking back on a number of older games recently has caused me to ponder a specific kind of 'discipline' that might be required to create a modern commercial game with the attitude of experimentation and discovery that was prevalent in the time of Bushido Blade. It's another manifesto kind of thing, and elaborates on the 'game noir' ideas I posted some time ago. I'll think some more and write on it soon. 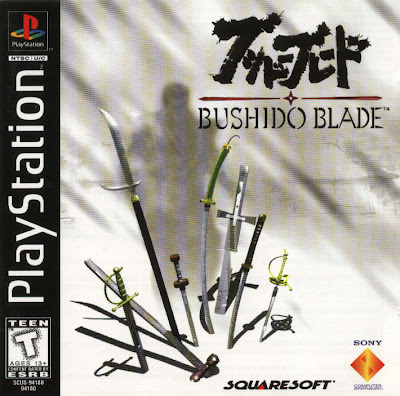 Bushido Blade is one of my favorites. I enjoy the game not only for its relatively deep Samurai Sword Duel simulation aspects, but for the meta-games that one can play within that structure. For example, one of my favorites is to pick two characters in the bamboo grove. One of them equips the short sword and the other the hammer. If you have the short sword, your job is to chop down all of the bamboo. If you have the hammer, your job is to kill the guy with the short sword before he accomplishes that task.